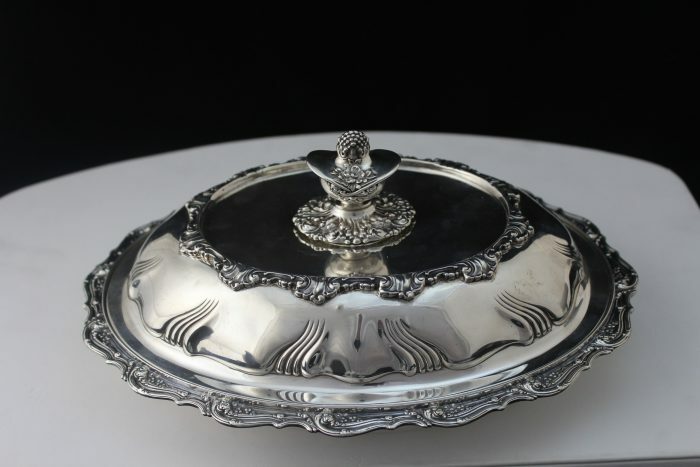 Made between 1897 to 1898, this stunning and elegant Sterling Silver Entrée dish is one not to be missed. Tiffany & Co. definitely showed intricate and delicate designs in this piece, with its oval form and patterned rims. You definitely won’t be disappointed. Scratched are visible on the outside and on the inside of the dish, as well as minor wear due to its age and constant use over the years. The floral patterned handle of the lid cover twists off for easy storage. A great addition to any Tiffany or Sterling Silver Hollow-ware collection! TIFFANY & CO., 13400 Makers 9813, Sterling Silver, 925-1000, T, 11 in.